With numerous Argentinian and foreign festival fanatics jam-packing the previous edition of Armada Beach, a return to Mar Del Plata, Buenos Aires was only a matter of time. 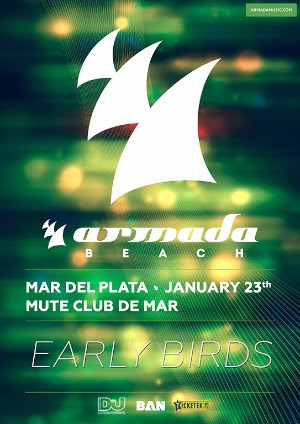 Just over one year after the previous Armada Beach event on January 4th, the all-embracing musical experience returns to Mute Club de Mar, once again bringing along various top-tier artists. January 23rd 2016 marks the brand new edition of Armada Beach, powered by award-winning record label Armada Music. This year’s edition marks the fifth consecutive allotment of the renowned event to the Mute Club de Mar. Previous editions featured top-notch headlining artists, including Aly & Fila, John O’Callaghan (2012), Markus Schulz (2013), Dash Berlin (2014), and once again Aly & Fila in 2015, complemented by other impressive acts, such as Andrew Rayel, Cosmic Gate, Heatbeat, and Orjan Nilsen. This year’s line-up still has mystery written all over it, but could very well be announced in the following weeks. Whatever world-class artists will be showing off their talents on the 23rd of January, the last editions have carved the way for the next slamming party.